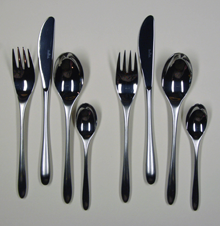 Stainless steel cutlery. Stainless steel is a relatively recent invention, discovered by Harry Brearley at the Brown Firth Laboratories in 1913. With trouble brewing in Europe, arms manufacturers had a strong interest in developing metals that were more wear-resistant for use in gun barrels. Brearley was investigating chromium iron alloys when he discovered one formulation that was especially corrosion-resistant. Cutlery of the day was made of silver (we still call it silverware), or more often, plated steel, but corrosion of the steel, and tarnishing of the silver, were ongoing problems. Brearley's "rustless steel" was immediately successful. Though his employers had little interest in becoming cutlery manufacturers, the success of the product motivated them to claim ownership of the patent. A legal wrangle ensued, and Brearley resigned. The outcome might have been much more beneficial for all concerned, including society at large, if Brown Firth had had a more sophisticated process for capturing knowledge generated as a byproduct of its problem solution experiments. The formulation of stainless steel that eventually became a standard, and which is still in use today, was developed by Brearely's successor. Read more at Wikipedia. Photo (cc) Hannes Grobe. As we've seen, collaborative problem solving does have risks — new ideas might be crushed prematurely, judges might be intimidated, and more. Risks continue when we move to experimentation or prototyping. Let's now examine how to avoid some of the troubles that can arise during experimentation. Most experimental efforts are designed merely to determine whether an idea "can work," but that isn't enough. We need to know not only whether the idea can work, but also what its weaknesses are, how severe they are, and how we can address them. Regard each experiment as an exploration of the solution and how it interacts with a hostile environment. Try to determine the consequences of its misbehavior, and the cost of eliminating that misbehavior. Experiments — especially well-designed experiments — create knowledge. Since experiments cost time and resources, we must be prepared to capture all the knowledge they create. We sometimes adjust experiments on the fly in response to what we're learning. Although these adjustments can be helpful if the adjusted experiment is still well designed, that isn't always the case. Sometimes the result of adjusting experiments on the fly is a muddled mess from which we can learn little, if anything at all. When conducting experiments to test newborn ideas, provide a means of capturing and storing generated ideas in such a way that they don't interfere with the ongoing experiment. When the new learning does demand immediate adjustment of the current experiments, take care to adjust them in ways that can still produce useful experimental results. That care takes time and effort, which means schedule and budget. One of the most common tales of tragedy is that of the prototype that got sold to a customer. The interference of production with experimentation creates two classes of problems. First, because the prototype was intended as an experiment, it often has attributes and structures that make it unreliable and expensive to maintain or enhance. Second, if the pattern of interference of production with experimentation has occurred before, the experimenters learned long ago that they must take steps to make the prototypes more durable than ordinary experiments would have to be. sold to a customer is that experimentation is more expensive than it needs to be, and maintaining or enhancing fielded products that are former prototypes is more expensive than it needs to be. In short, the result is neither a good prototype nor a good product. When conducting experiments to test newborn ideas, conduct experiments. Insulate the experiments from any pressure to convert them into products. Your experiments will be cheaper, and when the time comes to actually build a product, it will be built right. Would you like to see your comments posted here? rbrenheuWiUkZhCrdUHdzner@ChacUTNWyPfTnBQbsJwOoCanyon.comSend me your comments by email, or by Web form. See also Problem Solving and Creativity and Conflict Management for more related articles. I offer email and telephone coaching at both corporate and individual rates. Contact Rick for details at rbrenCDpEDIGYTNeIxTqzner@ChacTplLUhJreUccOlUGoCanyon.com or (650) 787-6475, or toll-free in the continental US at (866) 378-5470.